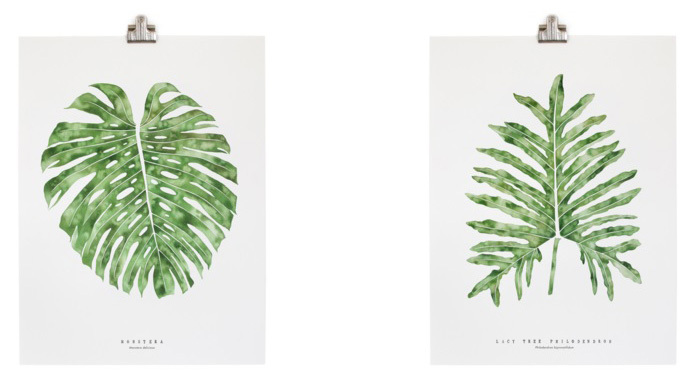 DESIGN CRUSH: BOTANICAL ARTISTS - HIP HIP HOME! I love discovering new artists on Instagram. It is such a great place to find and follow the work of contemporary artists. My current design crush is botanical art and here are my 3 favorite artists from around the world. Georgie is an artist living in Brighton, UK. She combines her love for fashion and florals to create unique illustrations. Scrolling through her Instagram feed makes my eyes pop. 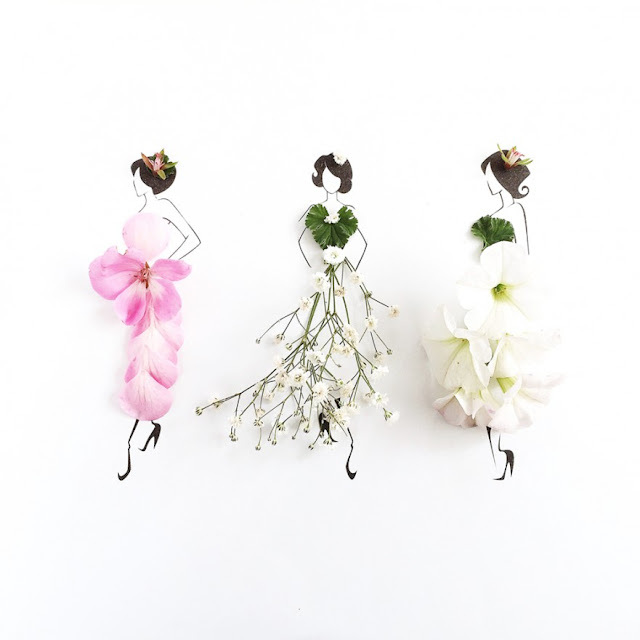 To me, there is nothing that makes a girl happier than combining flowers with fashion! Here is a glimpse of what she creates. You can also peek into the creative mind behind the work on Georgie's blog Painting Grace. Once in a while Georgie also creates free templates for us readers to download and create our own fashion floral art. Surely I couldn't resist. She also sells her art through her Etsy store where you can either download the illustrations, or buy her illustrated photographs, and yes they ship worldwide! Sarah is an American fiber artist living in Spain. 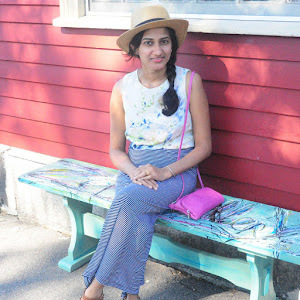 Many of you are already familiar with her work on Instagram. 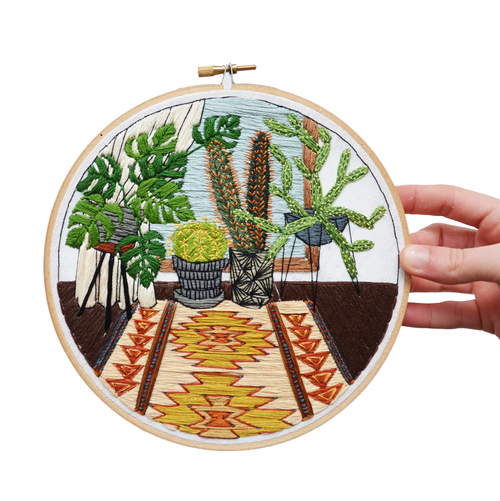 She creates contemporary embroidery of potted plants inspired by her own collection. Take a look at her work here. You can shop directly from her website, which ships worldwide. This March, by popular demand, Sarah kicked off a Monthly Pattern Program where you can subscribe to one pattern a month via her Etsy store. Through this program, you can download and make your own embroidered scene using one of her templates! I have written about Jenny Kiker here. Jenny is a Florida based artist who draws inspiration from nature (literally) and creates her own botanical water color paintings. 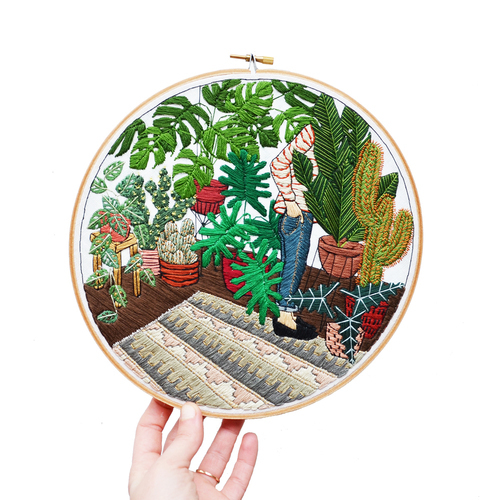 I absolutely love her work , which you can buy on her website LivingPattern. Occasionally on Instagram, she shares some behind-the -scenes action that goes into creating each piece. A few months ago Design Sponge collaborated with Jenny, to create 5 downloadable e-patterns for mobile devices. I am sporting two right now! I'm currently obsessed with the work of these artists. Their work is so unique and each of them so original, I can never get enough! Don't you agree? Oooh, the GEORGIE STCLAIR work is stunning! That's what I love about it too, so unique. And seriously who can say no to flowers and fashion right? I'm loving all three!